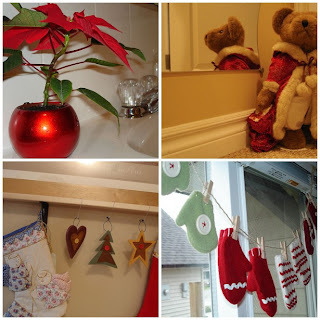 I think there's a set of rules somewhere that govern the photos common to all blogs. 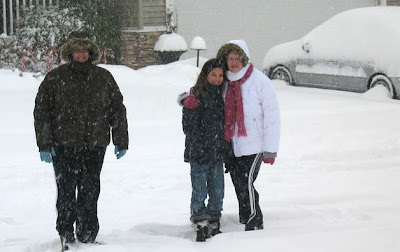 If it snows, you must post two (2) photos -- one showing the accumulation and the other showing at least one member of your family, out in the snow with the universal expression for "oh my goodness it's snowing! "I have these photos, check. Another on the list is surely the ubiquitous Christmas tree shot, which is awesome because I love seeing other people's trees. I didn't have one of those yet, so I'm remedying that today. I am strongly in the real tree camp when it comes to Christmas trees (although there will always been a place in my heart for the faux one we grew up with). This year with travel over the holidays and concerns about an unattended, and thereby un-watered tree we decided to look for an alternate. Inspired by Shannon's centerpiece from a couple of weeks ago we decided on a updated version of "sticks in a vase". The resulting tree is certainly nontraditional, but I find it charming nonetheless: I'm having some focus issues with my camera at the moment, but you get the general idea. The big present Christmases are all happening elsewhere this year so while this is a smaller tree it suits our purposes well. This is definitely the first year that I've paid attention to the weight of ornaments. There are a few favorites that were simply too much for the tree this year but I was amazed at how many we managed to get on. I'm not really sure where the top of this roundish tree is, and the star wouldn't have fit anyway so I added a little robin near-ish to the top. A British tree has to have a robin somewhere. I got the first part of my Willowtree nativity for Christmas last year and added the wisemen to it a couple of days ago. I was pleased to find that this place has just the right spot for it. I don't post a lot of memes, but this one made me giggle so I figured it was worth sharing: Courtesy of ICHC (a mostly family-friendly site, but watch out for the tag cloud). 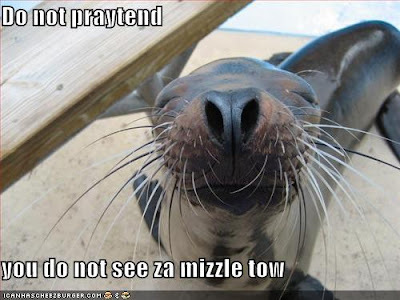 Now if only the cute little guy could spell, but seeing as Lolz is practically its own language these days, I'll let it slide. It's Christmas after all. Adrienne Shelley's Waitress is a delicious slice of a movie. 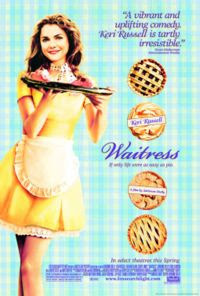 It tells the story of Jenna, a woman who 'doesn't want any trouble, doesn't want no baby [she] just wants to make pie'. Jenna's pie making is legendary, unfortunately so is her husband. Very early on I found myself gasping at his simple brutality and yet somehow Shelley manages to tell Jenna's story with very little violence. Waitress is, at heart, a movie with a lot of heart. Jenna, played by Keri Russell, is living a small town life and yet Shelley has refused to give her only small town answers. When Jenna discovers she is pregnant just as the local OB/GYN has semi-retired, Dr. Pottamer walks into her life. When the new doc in town turns out to be Nathan Fillion you think "oh, this is a falling in love with the doctor who's love changes everything" movie. But it isn't. And what it turns out to be is so much better, a real treat like Jenna's Falling in Love pie (even better than her Lonely Chicago pie). Dear Baby, I hope that at some point in your life someone wants to hold you for 20 minutes. And they don't pull away, or look at your face or try to kiss you. They just wrap their arms around you and hold on tight. Beautifully written, masterfully shot, Waitress is on another level a little hard to watch. The director who also wrote the film and played one of the main characters was murdered just before the film was accepted to Sundance. It is hard to see her there on the screen laughing and creating this amazing story and knowing that she is not around now to see its success. The story of Waitress is not as easy as pie, it's more complicated than that, but it is every bit as satisfying. Like so many of the pies that play out in the film, the ingredients of this story sound crazy but in loving hands they become an unexpected treat. I was going to say 'even Christmas-i-er' but I just couldn't bring myself to do it. Shannon invited us over for dinner and tree decorating on Tuesday. Here's Kendra and I with Coli and Amanda and the finished tree. It was really piling up. We actually had to buy winter coats this year. They're saying it will be the coldest winter on record. (I almost hope it will be, that coat is like walking around inside a giant hug. When I took it off to go indoors I felt bereft.) It's my first ever coat with thumbholes and the girls are right, thumbholes are made of awesome. Fleece cuffed sleeves that a) are actually long enough for my arms and b) stay in place. Brilliant. 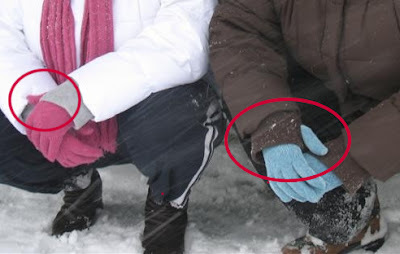 Gone are the days of a cold wind blowing across a bare wrist. Heaven. (If Heaven had snow.) Come to think of it why couldn't Heaven have snow? Maybe they have the snow-that-doesn't-land-on-roads ? I don't know about you, but when I picture Heaven it's always about 10 in the morning, a balmy 22 degrees with the sun shining and just in time for a midmorning cup of tea. We broke out the Christmas boxes tonight and it's starting to look very Christmas-y around here. We've decided to go with a rather nontraditional Christmas tree this year and I am delighted with the way it turned out. More photos to come, but this little guy was too sweet to wait. December 1 is World AIDS Day. I didn't know that until yesterday morning. Somehow the announcement got lost in all the Christmas commercials. 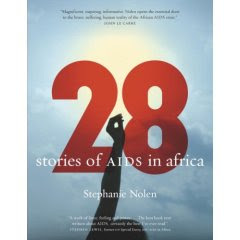 Back in the summer I started reading Stephanie Nolan's incredible book, 28: Stories of AIDS in Africa. I'm not quite all the way to end yet so I can't add it to the "books read" list but I'd recommend adding it to your reading list if you keep one. Prior to starting this book I thought I had a decent handle on what the faces of AIDS look like. And sadly, I've learned that my view of this far-away-feeling pandemic was tragically small. It's easy to think of AIDS as an African problem, but it's so much more than that. AIDS is a family where the 11 year old is running the household because there are no relatives left to take care of them. Everyone is dead. AIDS is the doctor no one believed could have 'a disease of the poor'. AIDS is a revolutionary who refused the medications that his compatriots were being denied. AIDS is entire villages of grandmothers who find themselves parenting again and worrying about what will happen when they are gone. The face of AIDS is a woman who contracted the disease from her own husband and was then kicked out for bringing disgrace to his house. AIDS, I'm learning, is unfathomably unfair. There are some who say that AIDS is a curse, God's vengeance for sin and I for one, am not brave enough to hold to a view like that. If God could punish one sin so violently, how much more could I expect to receive for my sins, which number far more than just one? God doesn't grade on a curve, we know that, and thank Heaven He doesn't. I wrote an article about that a few months back for work, and while it doesn't specifically mention the AIDS pandemic, maybe it's good reading for World AIDS Day, or thereabouts. I know it's a reminder than I need more often than I care to admit. If you haven't seen Enchanted yet, you really should. A delightful fairytale, it delivers many laugh-out-loud moments and refuses to take itself too seriously. If you remember laughing during the original Shrek when the singing bluebirds became breakfast then you're likely to enjoy this movie. Usually it's other people poking fun at Disney but finally they have grown-up enough to do so themselves. We had a great time. Right now, looking outside my window the snow is moving just as if it were inside a giant snow globe all swirly and light. It is also enchanting. I can appreciate it this morning -- there's nowhere I have to go, and for errands later Shannon's got the Durango. And that thing can drive anywhere. I never understood why so many SUV drivers ended up in the ditch until I had my first ride in a Durango on snowy roads last year. It feels like a tank (or at least the way I would imagine a tank to feel) thoroughly invincible. I can see how it would make you forget that you still need to adjust your driving to the conditions. I am always at odds with myself when winter finds its way to our fair west coast. I love it and I hate it, almost in equal measure. If could walk anywhere I needed to get to it could snow all it liked. I love the way it blankets the world in white, even if it is a fairytale and the grime of everyday living is only covered over not cleaned away. I love the sparkle and the light. It is magical, there's no denying that. But as Joss Wheadon taught us, magic always has consequences :) If it would just stay off the roads snow and I could be fast friends. Hmm, snow that falls on the ground but stays off the roads. Now there's a fairytale.